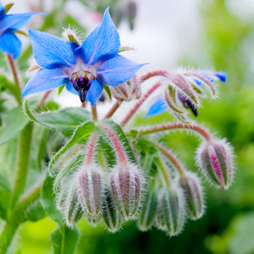 The Borage Plant has a small purple star-shaped flower. Only the seed of the flower are used for their rich oil. The seeds oil is high in the essential fatty acid gamma linolenic acid, a nutrient that is important for a healthy, well-functioning body. Borage oil, extracted from the seeds of the borage plant (Borago officinalis). It is used medicinally as an anti-inflammatory, for treating arthritis, as well as certain skin conditions and respiratory inflammation. More commonly Borage Oil is used for its rich natural source of gamma-Linolenic Acid (GLA), an important OMEGA-6 fatty acid which is required for healthy skin cell membranes. In the body, gamma linolenic acid is converted into prostaglandinl. Prostaglandinl helps heal inflammation of the skin and promotes skin health. Borage seed oil can aid in healing symptoms of dry and cracked skin, eczema and psoriasis (see References). It has one of the highest amounts of gamma-linolenic acid (omega-6) of seed oils - higher than blackcurrant seed oil or evening primrose oil.